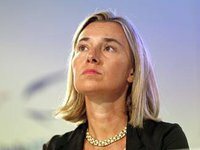 The EU expresses its utmost concern about the dangerous increase of tensions in the Azov Sea and Kerch Strait in recent days which has led to the seizure of Ukrainian vessels and their crews by Russia and shots being fired at them, wounding several Ukrainian servicemen, High Representative of the European Union for Foreign Affairs and Security Policy Federica Mogherini has said. "We are dismayed at this use of force by Russia which, against the backdrop of increasing militarization in the area, is unacceptable," reads the statement of the EU high representative for foreign Affairs released in Brussels on Wednesday evening. "We call on all for utmost restraint to de-escalate the situation immediately. In this context, we also call strongly on Russia to release the captured vessels, their crew and equipment unconditionally and without delay," the document says. According to Mogherini, "the illegal annexation of the Crimean peninsula by Russia in 2014 remains a direct challenge to international security, with grave implications for the international legal order that protects the unity and sovereignty of all States." "We reconfirm our condemnation of this violation of international law. The construction of the Kerch bridge constitutes a further violation of Ukraine's sovereignty and territorial integrity," Mogherini said. "The European Union reiterates its full support for the independence, sovereignty and territorial integrity of Ukraine within its internationally recognized borders. The European Union does not and will not recognize the illegal annexation of the Crimean peninsula by Russia," she said. She promised that the European Union will continue to closely monitor the situation and "is determined to act appropriately in close coordination with its international partners."